Rising Car Crime; Shelter Court Battle Wed; Stringer Subpoenas Mayor: Taxpayers Overpay For Slums? Security Patrol Gets Results; Poop Story Hits Fan! Police Investigate Rising Car Crime; Shelter Court Battle Wed; Stringer Subpoenas Mayor:Taxpayers Overpay For Slums? Security Patrol Gets Results; Dog Poop Story Hits Fan! Demand The Cans Back! Stringer Subpoenas de Blasio Over Slumlord Contributions. Are Taxpayers Funding His Presidential Campaign? Why is Aguila Important? They Mismanaged “Freedom House” Shelter, 316 West 95th St. for their partners, the Podolskys, who also own 330 West 95th St. and 315 West 94th St. Attention Building Captains and Neighbors! For the second time this year, a story from our newsletter caught Mayor de Blasio off guard and uninformed. On the Mayor’s weekly call-in show on WNYC hosted by Brian Lehrer, he hemmed and hawed about the dog poop issue until finally saying he just didn’t want dog owners to leave their poop on the sidewalk. Our point is that as Sanitation takes away more corner baskets, the streets are getting dirtier. DSNY noted that other neighborhoods also lost their cans. In our previous communications with Sanitation, DSNY maintains that less cans result in cleaner streets. “If we take away a can from one street corner, that corner is going to be cleaner than the three corners that have cans,” said one DSNY spokesman. Time To Can The Sanitation Commissioner! In other neighborhoods, residents are dropping their trash on the sidewalk where their missing cans once were. 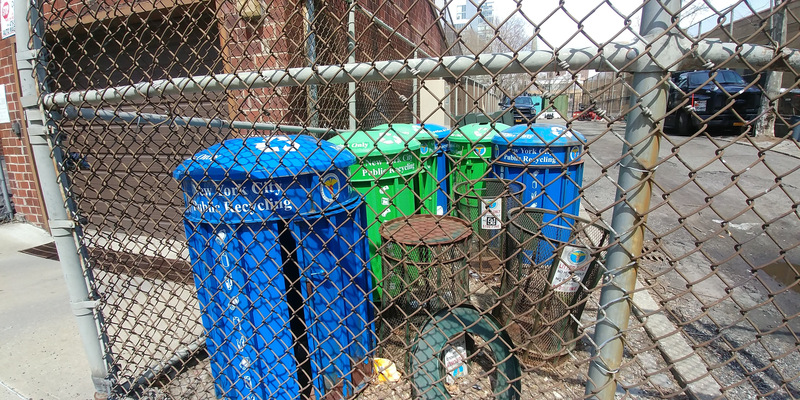 In our March 25th issue, we ran a letter from the Sanitation Department (DSNY) to a neighbor, which carried implied threats to further reduce the number of litter cans on the corners of West End Ave. and Riverside Dr.
Our story became a media sensation, with West Side Rag picking it up, so to speak, then Channel 5 WNYW, The Gothamist and WNYC Radio. The original DSNY response was triggered by a letter to the Mayor about the 2018 removal of 116 corner WEA and Riverside receptacles. 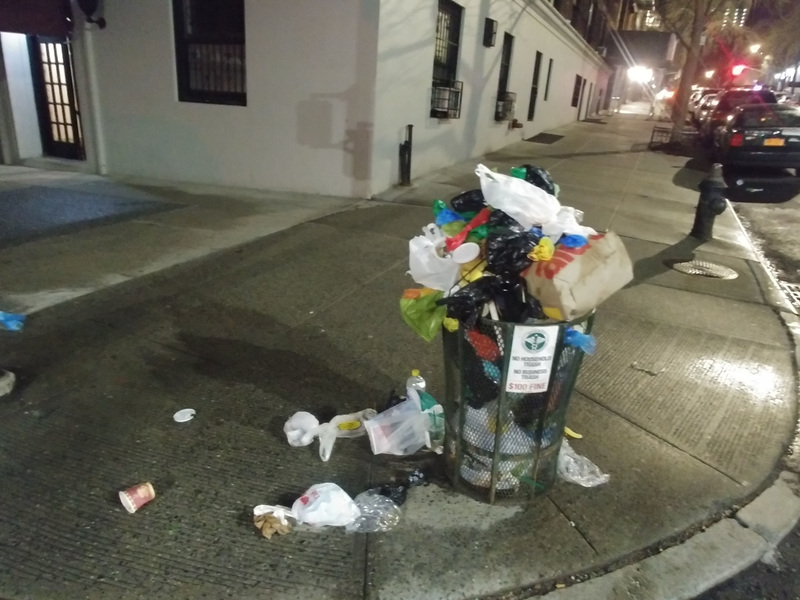 DSNY Deputy Director of Community Affairs, Debra Barretto, wrote that our neighborhood, as a residential area, did not require any litter cans at all. Thus, the remaining cans were there at the discretion of DSNY, i.e. half the corners on Riverside and West End would still have cans. (Our original story may be found at www.N90s.org. It includes DSNY’s reply). We are hoping that Assembly Member Linda Rosenthal can study this matter. It seems counter intuitive that a department called “Sanitation” is making our streets dirtier. Riverside Drive and West 95th Street are now among the worst places to park a car in our neighborhood, an issue N90s raised when the 24th Precinct “Sector A” Neighborhood Policing (NCO) program held its quarterly meeting with the public on April 5th. Sector A covers 86th to 110th Streets, west side of Broadway to the Hudson River. Police report that they are working on the problem and have identified a “person of interest” who is suspected in the rash of smash-and-grab robberies and the theft of side view mirrors. The latter item may cost around $3,000 to replace. A similar spree of grand larceny auto (GLA) crime was also reported by the 20thPrecinct which covers the Upper West Side below 86th St. Since the January front page New York Post story on the N90s Security Patrol caught Mayor de Blasio’s attention, the neighborhood policing units have been dispatching radio cars to the West 90s in greater numbers. The increased police presence is appreciated by our neighbors. The issues we face in our neighborhood are in fact citywide issues. Anyone who travels through our subways, major train and airport terminals knows that. The reason the City’s quality of life may look worse is based in facts, not anecdotes. Governor Cuomo cut the number of mental health beds by 11%, which no doubt adds to the ranks of the street homeless. A recent Daily News article revealed that NYS dumped 8,000 prisoners, over the past two years, into the homeless shelter system, with no halfway houses or counseling services. A study conducted several years ago by N90s, aided by publicly available data, found that the Upper West Side is home to nearly 4,000 special needs beds which serve homeless populations. About 90% of these beds are located between 90th and 110th Streets. That’s why we believe your support for the N90s patrol is urgent and necessary! Whether the City calls a facility that houses the homeless a shelter or supportive housing (for people taken from the homeless pool and often recently in jail and having mental health and/or substance abuse issues), our neighborhood has an unacceptable concentration of homeless housing. We have more than the NYPD can handle. We have far less mental health hospital beds than what is needed to serve this population. While the Mayor in his 2017 homeless plan, “Turning The Tide” promised 90 new shelters throughout the City, in and near the home neighborhoods of homeless people, few have materialized. Once again, the Upper West Side bears an unfair share of the City’s burden. N90s has tried to work with City officials. We have served on several community advisory board for shelters. But the reality is that City homeless officials are only interested in filling in boxes, while flouting the City Charter Fair Share law. And our elected officials are mostly tone deaf. The lawsuit is not just against the Alexander. There are other sites throughout the 90s that could be targeted for new facilities. The lawsuit sends a message to City government that a neighborhood that is bending under the weight of its compassion, has done more than its Fair Share. It’s time for a moratorium! Please support our efforts to fight back. Lawyers and private security guards are expensive. The alternative is unthinkable. We ask that more people step up—individuals, building owners, business owners, co-op boards and tenants—and contribute to keep these two important efforts going. Checks may be written to: Neighborhood In The Nineties, Inc. You may indicate “Security Patrol” or “Legal” on the check. Address: Neighborhood In The Nineties, Suite 1B, 310 West 94th Street, New York, NY 10025-6868.
Credit card donations are accepted at www.N90s.org. Hit “DONATE,” follow PayPal prompts. This Tuesday, April 16th: AARP Shredding Event. The shredding truck will be in front of Goddard Riverside Community Center, 593 Columbus Ave, near West 88th St. between 10 AM and 2 PM. But get there early, because when the truck is full, it’s over!